FAYETTE, Iowa (December 3, 2014) – Emma Hough graduated from Upper Iowa University in 1926. UIU has celebrated Hough’s milestone birthdays each year since 2012. 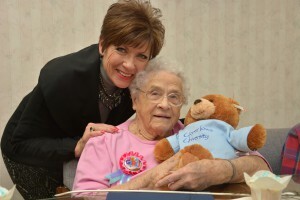 Marking this momentous occasion of her 110th birthday, the President’s wife Sharon Duffy bestowed many Upper Iowa gifts upon Hough and her friends, as well as brought special cupcakes to celebrate the event. A native of Sumner, Iowa, Emma was the second child born to Albert and Sarah (Lauterbach) Burkhart. Her older brother, Charles, was 17 years her senior. They did not have much of a relationship, and after marrying, he took over the family farm. When she was 7-years-old, Emma and her parents moved to town, which was a welcome change for the outgoing child. With friends living just a few houses up the street, Emma had plenty of neighborhood chums to pal around with. They spent their days playing ‘Run, Sheep, Run’ all over the neighborhood. When it came time for Emma to consider what she would do after high school, she insisted that she go to college. She chose Upper Iowa University, located just 14 miles away. Her father said, “Well, I’ll take her over, but she’ll never stay.” But stay she did. She hardly ever went home, and even took classes one summer after working out a deal with her mother: Emma could stay at Upper Iowa, if she agreed to take a sewing class (“I made five dresses for myself that summer!”) and a swimming class. She also took a course in education. “I was glad to get that out of the way,” Emma said. Emma was active in campus life. She was a member of Sigma Tau Delta, an organization whose purpose was to promote “the mastery of written expression encouraging worthwhile reading and fostering a spirit of fellowship among those specializing in English language and literature,” according to an excerpt from the 1926 UIU yearbook, the PEACOCK. She was also a member of the Biological Club (she held the offices of president her senior year and secretary/treasurer her junior year), Aonia, YWCA, vice-president of the WAA (an athletic group for women at UIU), PEACOCK yearbook staff, an assistant in botany and the winner of the campus tennis tournament her sophomore year. Emma said that while she spent a lot of time studying at UIU, she and friends found time to hike to Big Rock, a popular swimming hole on the Upper Iowa River near Fayette. She also remembers the one and only time she was kicked out of a movie theatre. “I think it was because I was running in and out looking for someone – that was the main thing,” she recalled laughing. Emma and her dorm-mates also snuck into the basement of South Hall, where they lived, and raided the olive barrel from time-to-time. She well-remembers the long-distance hikes, sometimes over six miles that the classes did as part of their gym requirement. She also recalls an extensive history class her freshman year that had three separate components. Emma was not required to student-teach before she graduated. Her diploma qualified as her teacher’s license. One year after starting her teaching career, a new member of the Sumner School District faculty caught Emma’s eye. She and Osage native Charles Hough, who was the business teacher, began dating. They married February 4, 1928. The pair continued teaching in Sumner until 1944 when they moved to Ironwood, Michigan, in the Upper Peninsula. Emma taught physical education there. Then, in 1953, the couple accepted teaching positions in Manistee, Michigan, and Emma became the school librarian. During that time, Charlie worked on his master’s degree in commercial studies, and the couple spent five summers living in New York City where they attended Columbia University. It was a remarkable time for Emma and Charlie as they not only studied but roamed the city and did much sightseeing while they lived there. The couple rented rooms in people’s houses when they lived in New York. They saw many Juilliard School performances and went to a lot of baseball games. They saw the greats in their hey-day – Whitey Ford and Babe Ruth. Charlie was a Chicago Cubs fan, while the New York Yankees have always been Emma’s favorite. In 1969, the couple retired from teaching and two years later, they returned to Sumner to live. Charlie passed away in 1981. Soon after, Emma headed out with friends to explore the world. She has traveled to 48 states including Alaska and Hawaii, and traveled to England and Germany as well. It wasn’t until Emma turned 95 that she put away her suitcases for the last time. Since 2003, Emma has resided at Hillcrest Home in Sumner where she still walks at least a half-mile a day. She maintains an adventurous outlook on life and a feisty spirit. Her many feats have been chronicled in the local newspaper including an excursion in a Lambourgini, a camel ride when the circus came to Sumner and letting a boa constrictor drape itself around her shoulders.